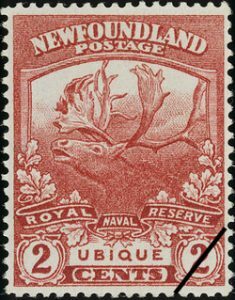 Dooley was referring to a set of stamps that were released a month earlier on (January 2, 1919) by the Newfoundland Postal Department, a 12 stamp commemorative set, to honour the services and memory of the Newfoundland contingent in the war. The stamps were printed in response to a stamp shortage developed in Newfoundland. The government and in particular The Postmaster-General, J. Alex Robinson (JAR) wanted a new issue that favored a patriotic subject. The phrase, “Trail of the Caribou” was created with Lt. Col. Thomas Nangle, Roman Catholic Chaplain of the Royal Newfoundland Regiment. The badge of the Regiment consisted of the head of a caribou over a ribbon lettered “Newfoundland”. Below the caribou is a ribbon entwining oak leaves. The “caribou” used is certainly magnificent, but perhaps a bit bizarre, the picture of the caribou is a composite of a caribou with moose antlers. 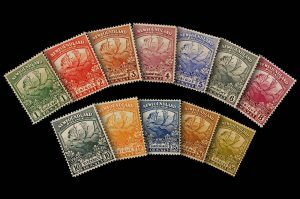 Of the twelve stamps, four commemorate the work of the Naval Forces, and bore the word “Ubique”, meaning everywhere. Newfoundland’s sailors could literally be found everywhere on the sea. The remaining eight stamps in this series each commemorate a specific engagement in which the Royal Newfoundland Regiment participated. The engagements are: Suvla Bay, Gueudecourt, Beaumont Hamel, Monchy, Langemark, Cambrai, and Combles. all in France. Steenbeck was at Belgium, Suvla Bay was at Gallipoli, Turkey. 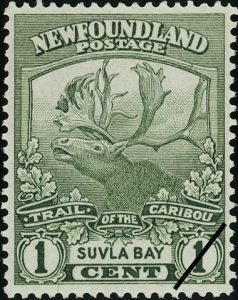 The 1919 “Trail of the Caribou” set was printed by De la Rue and Company in sheets of 100 (10 x 10). The postal rates for letters up to one ounce were, at the date of issue: domestic 3-cents, drop rate 2-cents, UK Commonwealth 3-cents, and foreign 5-cents. Registered letters were 5-cents and special delivery 10-cents. 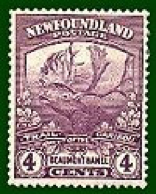 One of the first critics of the newly issued ‘Trail of the Caribou’ stamps was The Governor of Newfoundland, Sir Charles Harris, he went so far as to request the issue be withdrawn from sale since it did not portray any of the “Majesties.” The Government, however, took the position that there was no slight intended and furthermore that Newfoundland’s stamps were not required to bear their likenesses of their Majesties. This entry was posted in Uncategorized and tagged postal, soldier, stamps, Trail of the Caribou on February 28, 2019 by Larry Dohey. 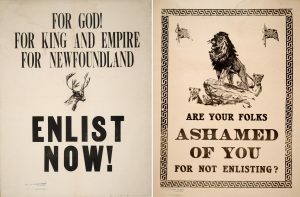 In February 1919 many young men who had signed up to fight for “King and Country” were returning to Newfoundland and Labrador, many were welcomed home to friends and family with a party in the local parish hall. Private Michael Ryan (20 years old) of Michael Sr. of Caplin Bay, (now Calvert) arrived home from France by the Corsican, he was home after two years of service having seen some of the most severe fighting of the war, but came through without a wound. On Friday night (February) 14th the ladies of the harbor tendered Private Ryan a splendid reception in St. Joseph’s School (Caplin Bay, now Calvert) . Everyone in Calvert was very aware that when Private Ryan left Calvert – he was with his good friend Charlie (Canning) they had left Calvert on the same day to go to the recruiting office in St. John’s, February 8, 1917. He then presented Private Ryan with a purse, and gold watch and fob (chain) from the men of the men of Caplin Bay (now Calvert) as a remembrance of his home coming. As he stood on the stage in the parish hall with the watch in hand he looked down at his family that included his father Michael (Sr) sister Hannah, 24, his sister Ellen Sullivan of Caplin Bay, his sister Bride Battcock of Brigus South, and his sister Julie Brine of Cape Broyle. 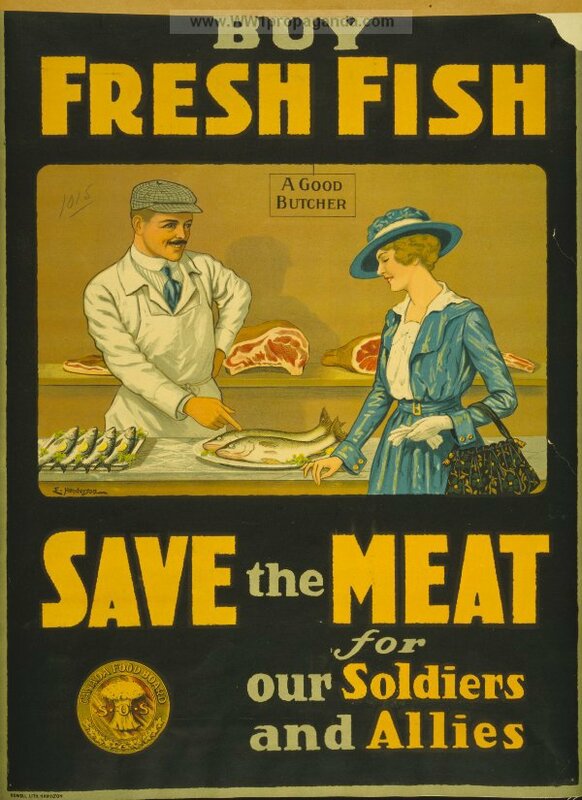 NOTE: Fritz or Fritizies was also a name given to German troops by the British and others in the First and Second World Wars. 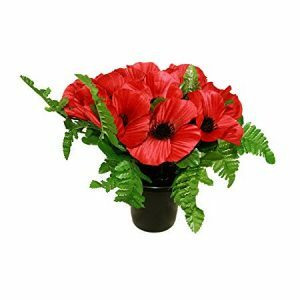 The Passing Over of Michael Ryan – They dropped red poppies in his grave. For the rest , he lived at Calvert all his life and married (Bridget Clancy) there and raised a large family – Michael, James, Francis, Edmund, Helen (Clowe), Reverend William J., Reverend Kevin, Philomena Keough, Genevieve and Marie, Presentation Convent, St. John’s. A guard of honour of the Canadian Legion escorted the funeral cortege to the cemetery on the hillside towards Ferryland – and when the final prayer had been said and the Legion ritual read, dropped red poppies in his grave. “And they buried him among the fir trees where the hill slopes towards the broad Atlantic – within the sight and the sound of which he had lived all his life”. This entry was posted in Uncategorized and tagged Calvert, Caplin Bay, home coming, Michael Ryan, soldier on February 25, 2019 by Larry Dohey. 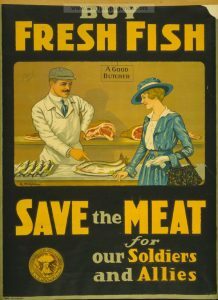 This entry was posted in Archival Moments and tagged cod, fish, ration, soldier, world war one on January 30, 2019 by Larry Dohey.